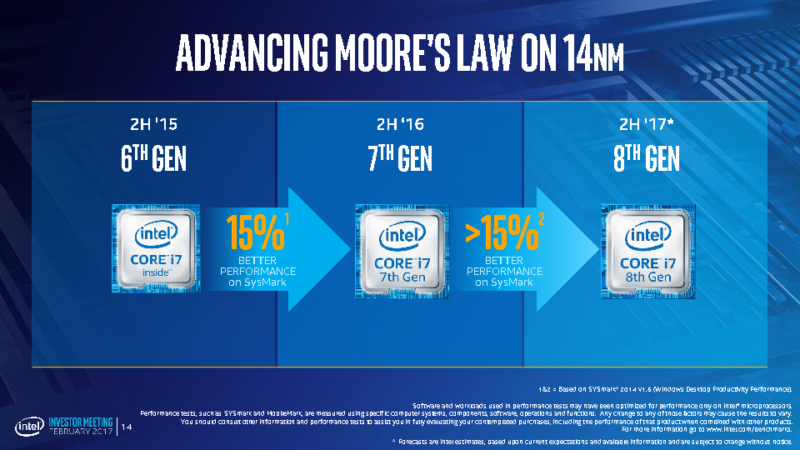 Intel's presentation at Computex revealed a 15W 8th generation (presumably mobile) CPU with 4 cores and 8 threads. The unnamed chip was shown outperforming a Kaby Lake i7-7500U CPU by 30% in SYSmark 2014. While desktop enthusiasts are drooling over Intel's latest US$2000 18-core Core X desktop CPUs, mobile computing enthusiasts are teased with the tantalizing prospect of 4-core 8-thread Coffee Lake CPUs operating within a TDP envelope of only 15 watts. During its Computex presentation, Intel announced that its upcoming 8th generation Coffee Lake mobile CPUs will be up to 30% faster than Kaby Lake. This is double the previous increase that Intel was touting at CES in January, but there is a reason for that: this 30% increase is specific to comparing a Kaby Lake i7-7500U 15W CPU (2 cores, 4 threads) to Coffee Lake 15W (4 core, 8 threads), and only in one benchmark sample at that. Additionally, the yet-unnamed Coffee Lake CPU has a 4.0 GHz turbo boost — 500 MHz faster than the i7-7500U's. Of course, one would naturally expect a next-gen with higher clock speed and twice the cores of an i7-7500U to outperform it — but it's still impressive that Intel has managed to fit a quad-core hyper-threaded CPU into a 15W TDP. We are excited for what 4-core 8-thread 15W CPUs will mean for portable computing in the near future.